The BPSim Perspectives have four pages, or tabs, of data in common. These are the 'Scenario', 'Calendars', 'Properties' and 'Review' tabs, the first three of which are also reflected in the data hierarchy on the left of the window. The data specific to each Perspective is discussed in separate topics. The Save button, Validate Button, Export button and Run button are also available across the configuration, to save all changes made, to validate the configuration, to export the configuration and to execute the Sparx Systems Business Process Simulation engine (if available) on the current configuration. Because these tabs are in common, you might prefer to populate them with data in a 'base' version of the configuration and use inheritance to make that data available to other configurations. This helps reduce the work in defining the data in the first place, and avoids errors in repeatedly entering the same information in different configurations - you only have to enter it once. This tab defines any number of special periods of time that can influence the process, such as working days, shifts, holidays or periodic events (for example, stock-taking, inventory or auditing). You select these calendar periods as factors affecting the progress of a particular action in the process; when you click on a calendar period on the 'Calendars' tab, the lower panel lists the activities and parameters that apply that period to the process. Click on the New button to display the 'Event Recurrence' dialog. In the 'Event time' panel, the 'Start' and 'End' fields both default to the current time. The 'Start' field is the anchor; a change to either the 'End' field or the 'Duration' field automatically updates the other field, in reference to the 'Start' field. Click on the hour and minute segments of each field (and, for the 'Duration' field, the 'Day(s)' segment) separately, and use the 'spin' arrows to set the start time and the end time or duration of the period. 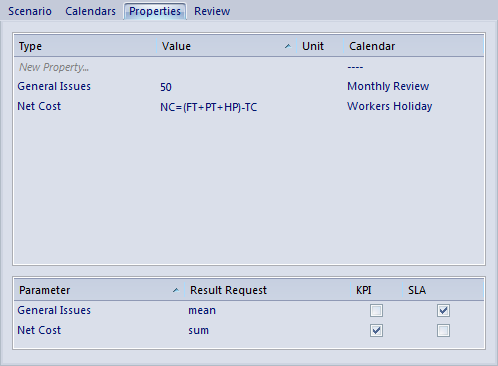 In the 'Recurrence pattern' panel, select the radio button for the interval at which the calendar period recurs. Each option displays an appropriate set of fields in the right of the panel for refining that interval to every day/week/month or every two/three/four days/weeks/months, on a particular day of the week, or day or date of the month, or day or date in the year. Select the checkboxes or values in drop-down lists as appropriate. 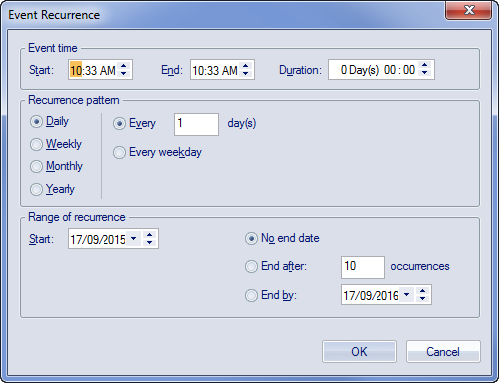 In the 'Range of recurrence' panel, select the date on which the calendar period takes effect and select the appropriate radio button to define when the period ceases to apply - never, after a set number of occurrences, or on a specific date. You can select an end date either from a drop-down calendar or using the 'spin' arrows on each segment of the date. Click on the OK button to set the calendar period. As you define calendar periods, they are listed in order of the start date and/or time, earliest first. Either click on the defined period and click on the Edit button to display the 'Event Recurrence' dialog again, or double-click on a value to change it directly on the 'Calendars' tab. All new calendar periods have the default name 'Calendar_n'; it is recommended that you directly edit the name to a string that identifies the nature or definition of the period. This tab is used for defining global properties; that is, properties of the scenario, or properties that have even broader application, such as 'Number of Issues' or 'Net Cost'. A number of objects throughout the configuration have their own 'Property' tab, for features specific to that object. Click on the New Property text and type in the name of the property. Click on the icon in the 'Value' field. The 'Parameter Value' dialog displays, from which you select the appropriate tab to define the value itself or the expression to derive the value. When you have defined the value, click on the OK button. In the 'Unit' field, if necessary, type the unit of expression of the value you have defined. For example, Hours or $K. 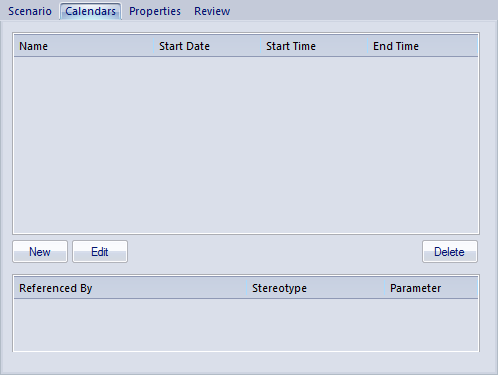 In the 'Calendar' field, if this property can be modified by a defined calendar period, click on the drop-down arrow and select the appropriate period. 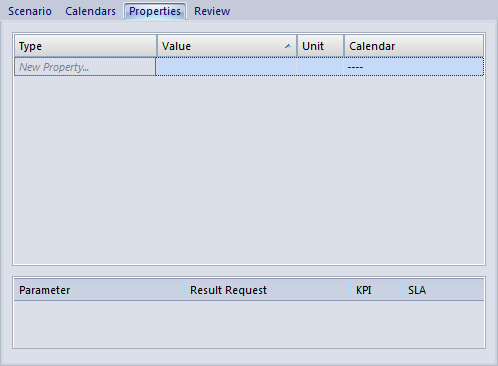 In the lower panel of the 'Properties' tab, and of the object parameter tabs throughout the configuration, most of the possible types of parameter appropriate to the tab are listed. For many of these parameters, you can click on the drop-down arrow in the 'Result Request' column and select the type of processing of that parameter you want to check for in the simulation results, such as a count of the number of times it was used, or the sum, mean, minimum or maximum value used, in the context of a specific activity or of the Business Process as a whole. Certain parameters, such as 'Priority' and 'Probability', would not have any meaning in this context and either are not listed or cannot be set in the 'Result Request'. You would then execute a customized simulation, which will only show the parameters you have selected to review. You can also specify whether the parameter is a 'Key Performance Indicator' (KPI) or part of a 'Service Level Agreement' (SLA), by selecting the appropriate checkbox against the parameter. The 'Review' tab presents a summary of the saved changes that have been made to the object parameters and properties in the configuration, during the current work session. You cannot change the data captured on this tab. It is possible to validate your BPMN Model and BPSim Configuration. Clicking the Validate button in the configuration will validate the model and configuration; all errors and warnings will be reported in the System Output window. Alternatively, you can select a root Package containing a BPMN model and BPSim Configuration, and then select the 'Design > Package > Manage > Validation > Validate Current Package' ribbon option.